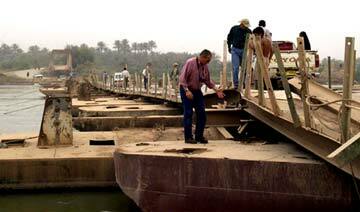 A contractor from Bechtel Construction, assesses a bridge in Al Aziziyah, Iraq in 2003 to decide what repairs need to be made. 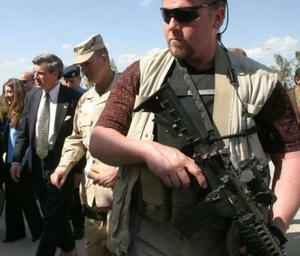 A bodyguard from Blackwater USA (right) protects former Coalition Provisional Authority head Paul Bremer (left) in Iraq in 2004. "The Department of State primarily utilizes private security firms in Iraq for two major functions. The first is static guard services at our facilities. These contract security operations are similar to local guard contract programs we utilize at our embassies, consulates, and residences around the world. The services we provide are primarily for the protection of U.S. Government employees and staff. We do not provide security services for private companies, non-governmental organizations, or implementation partners. However, we are willing to share our contract requirements with those organizations supporting our effort through the Overseas Security Advisory Council, or OSAC, domestically and in Iraq. In closing, I would like to say that our ability to provide protective operations on the scale required in this high-threat environment would not have been possible without using private security providers. The number of personal security specialists we utilize in Iraq alone is more than all the Diplomatic Security agents we have globally. We could not have hired and trained new agents to meet this requirement as rapidly as the contractors met the requirement, even if we had the funding and FTE [Full-Time Equivalents] available. Meeting this relatively short duration requirement using competitively bid contractors along with establishing high standard requirements is the best possible solution for these circumstances." "The use of private security providers reflects the uncertain security environment that was, and is still being encountered in Iraq, as well as the fact that providing security for agencies and contractors is not part of the U.S. military’s stated mission. U.S. military forces in Iraq provide security only for those DOD civilians and contractors who directly support the military’s mission. Static security – security for housing areas and work sites. Personal security details – security for high-ranking U.S. officials. Security escorts – security for government employees, contractor employees, or others as they move through Iraq. Convoy security – security for vehicles and their occupants as they make their way into Iraq or within Iraq. "Q: But the role [of private military contractors and private security contractors] in the Iraq war is proportionately greater [than in other conflicts]? Brooks: Yeah, it's probably a little bit more. Q: So why is that? Q: And all of this, of course, requires -- the larger the tail, the more protection the tail needs along the way. You have to protect the convoys. Brooks: Right. And that would apply whether it's military or civilians that are doing the logistics. Even military logistics need security. So that's always a plight. Q: So you've had a big expansion in the role of private security and private military contractors. Brooks: Right. Now, I think you have to keep in mind that the security companies, their size goes up and down as their contracts go up and down. So we have what has been called ... the Baghdad bubble. Essentially, you have a time when there's a lot of need for security for both the reconstruction effort, for the convoys, to protect a lot of things going on, and the politicians. And how do you create a democracy when all the politicians are being killed off by insurgents? You've got to protect them. So there's a big role for security right now. Now, as the security situation improves and as the Iraqi military comes online and the police, you'll see less need for the private sector."